The web and internet are ever evolving and having an online presence is no longer an option, but a requirement. We can help with all aspects of design, development and hosting. Do you already have a website but not enough time to manage it? We can do it for you. From domain maintenance, to SSL certificates, to the general upkeep of your server. Beautiful and attractive graphics not only attract more users to your website, they also make your user's experience more pleasant. Just tell us what you need and we can help you make a great impression. Do you need a store-front? Do you need an easy way to manage your online inventory, customers, payments and shipping? We are here to help. From 1 product to 1000s of products, your business is our business. Do you have a special event? Do you need a landing page? We can help you keep your customers informed about event activities through count-down timers, newsletters, sms and social media. All of our websites are mobile-ready. Responsive websites, which can work with all mobile devices, including tablets and chrome books, are always a forethought in our designs. During development and design, mobile is the first we test. Social Media such as facebook, twitter, instagram, google+, etc play a critical role to the success of online businesses. Our team understands this new medium and is here to help you promote your business and products effectively. Our event count-down pages are a great way to keep you connected with users. 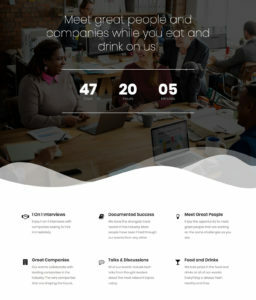 These pages are an effective way to maintain a web presence, keep your users informed and remain connected.